The Orange County Mayor’s Veterans Advisory Council hosted the annual War Memorial Commemoration Ceremony at the Orange County Courthouse on Memorial Day, Monday, May 28, to honor the legacies of the fallen servicemen and women from the United States Army, Navy, Marine Corps, Air Force and Coast Guard. 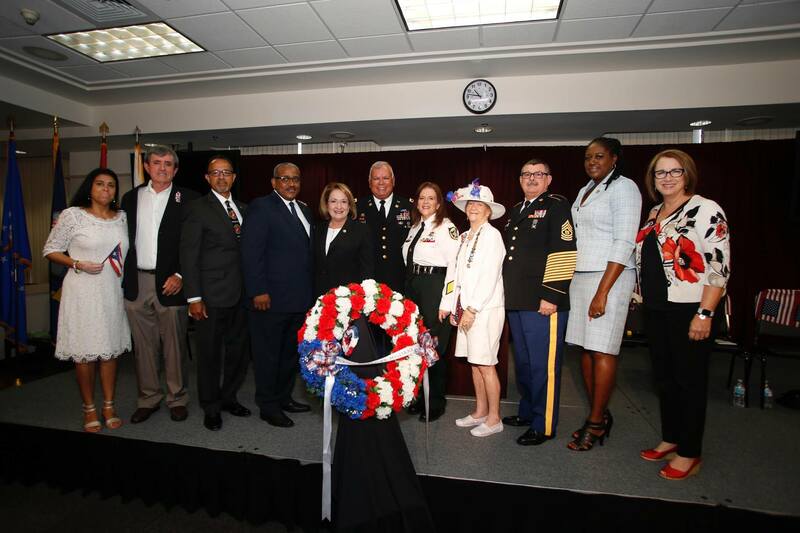 Orange County Mayor Teresa Jacobs, Senator Victor Torres, Jr., State Representative Robert “Bobby” Olsewski, members of the Board of County Commissioners and other local elected officials joined military families at the event to commemorate Memorial Day in Orange County. The ceremony’s keynote speaker was former U.S. Marine, Allie L. Braswell, Jr. He also serves as a Civilian Aide to the secretary of the Army for the region. Retired U.S. Army Colonel Edwin R. Marrero, Orange County Mayor’s Veterans Advisory Council Chair, hosted the ceremony. Retired U.S. Army Command Sgt. Maj. Tommie Maldonado lead the Pledge of Allegiance, and Cindy Clark from the Orange County Sherriff’s Office performed the national anthem. Additionally, Ellouise Hall member of the Daughters of the American Revolution provided the invocation, and Retired U.S. Army First Sgt. Dalia Espeur-Jones provided the benediction. After the event, Mayor Jacobs met with families and active duty military and veterans in the audience. Photo Caption: Orange County Mayor Teresa Jacobs and the Orange County Mayor’s Veterans Advisory Council honored fallen patriots at the annual War Memorial Commemoration Ceremony at the Orange County Courthouse.